Just Julie B's Stampin' Space: One Sheet Mini Scrapbook & Gift Bag! This little scrapbook is perfect when you have some pictures to share with a loved one, and you want to put them together as an extra special gift. The base of this mini scrapbook is made from one sheet of cardstock, and features the Swirly Bird Bundle. There are 12 pages to put pictures on, with three inner decorated sections. 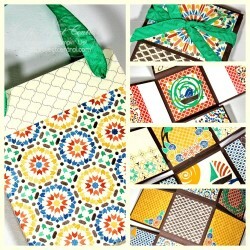 This gift is finished off with a coordinating gift bag that’s made with one sheet of Moroccan Designer Series Paper. This fun project was made by Christy Fulk and you can get her tutorial when you subscribe to the month of December over at Craft Project Central.